There are so many different LED uses. LED lights are useful anywhere from concert venues to home pools. 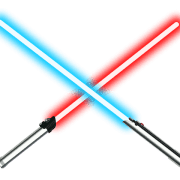 Businesses are also using them at conventions and events. Surprisingly, there are even cost-effective party supplies that you can purchase for your own events at home. Below are our top 10 picks of uses for LED lighting. Some are practical for purposes and others are purely for entertainment. 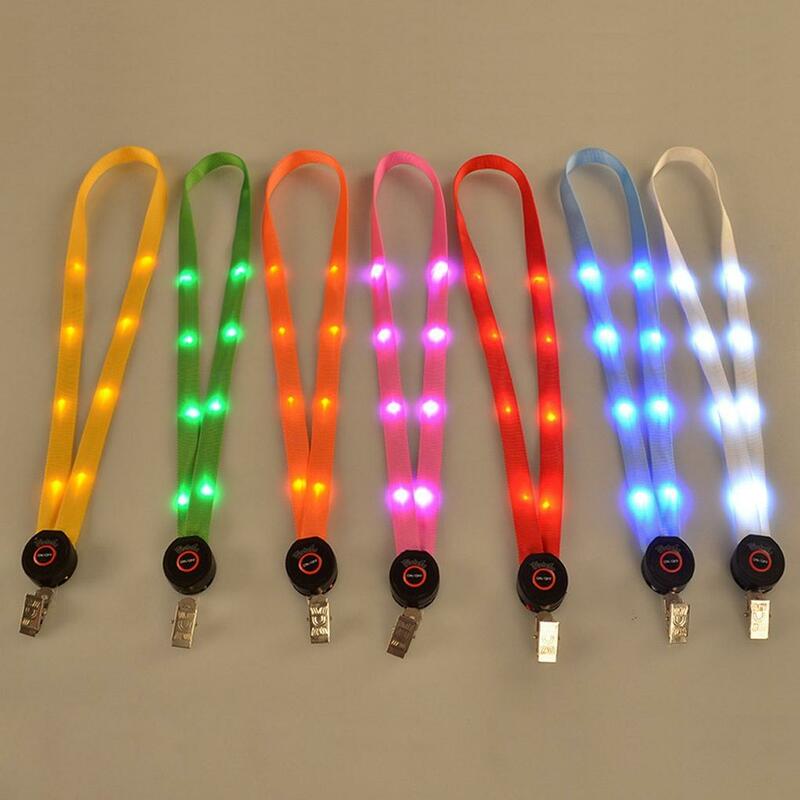 Out of all LED uses, lanyards are something that we didn’t know needed improvement. However, now that we have seen their improvements we never want to go back to the old style. Conventions use ID tags and lanyards to keep track of the attendees. Some conventions even require them for any extra activities or for meals. Therefore, these tags are important. They are also worn for the majority if not entirety of the convention. Often time attendees will keep ID tags and their lanyards as keepsakes. A convention usually provides a plastic covering that is attached to a lanyard. This is not only for protection. Also, it is for easy transportation and keeps the tags close by to attendees at all time. It truly is the perfect opportunity to take something of use and also make it fun. Something else on our list of LED Uses is Light up Wristbands. They have a lot of different applications. Concert-goers have seen them either on stage or in the crowds. They are also useful within the media. Therefore, even T.V. shows who are taking advantage of this great technology. One T.V. 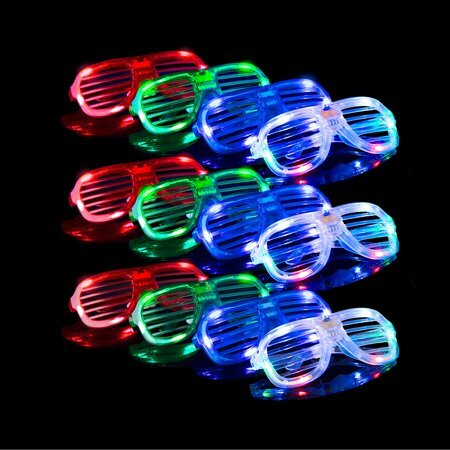 show, in particular, has based the majority of its crowd interaction on these light up accessories. The show Winsanity recently got added to Netflix. However, it has been on the air since 2016 on the Game Show Network. What is the basis of this show? Every audience member is given a “Winwatch”. Therefore, throughout the show, these watches glow to indicate that certain audience members have been selected either to win prizes or play the game. Pretty Cool right? We think so! There are many different LED Uses. One, in particular, has become an attraction for many city goers. Bridge lighting. Many cities have embraced the attraction of LED lighting. Along with the lighting, often times they will set these light shows to music. As you can watch below, in Memphis they put on an entire show with their LED bridge lighting set to the song Walking in Memphis. There are so many other attractions that have been made with LED lighting. 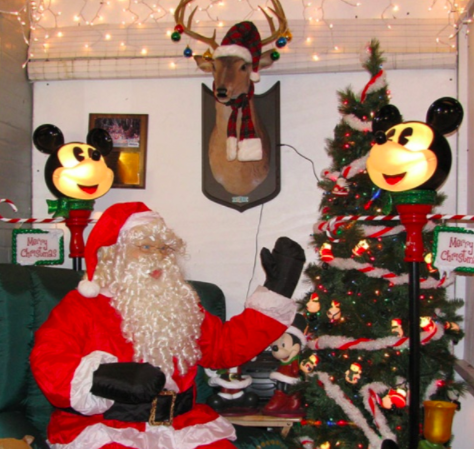 There are holiday shows at parks and preserves every year. Below is a video of a holiday light show at an Audubon Outdoor Preserve. The LED lights created an entire atmosphere. Along with the many displays, there were also interactive elements. Furthermore, with the use of LED lighting, the seasons come to life. When you have a pool it isn’t just for yourself. Often times, when the weather is nice, everyone calls their friend with a pool. Due to this, gatherings can happen at any time of day or night. Therefore, pool lighting is important. Also, lighting can serve multiple purposes. As you will see in the video below there are two main reasons to have pool lighting. The first is for aesthetics. LED lighting can add ambiance to any pool. The second is for safety. A well-lit pool can help prevent unnecessary injuries. For more information watch the video below for some helpful pool lighting tips. Christmas is a time for spending time with family and friends. A favorite past time for many is checking out the displays that people put up in their yards. However, without LEDs, these incredible displays would not be possible. Christmas displays are one of the best-LED uses. They can be simple or they can be extravagant. Either way, they are worth checking out. Another great use for LEDs is for party supplies. Any party or event can be elevated with some LED lighting. 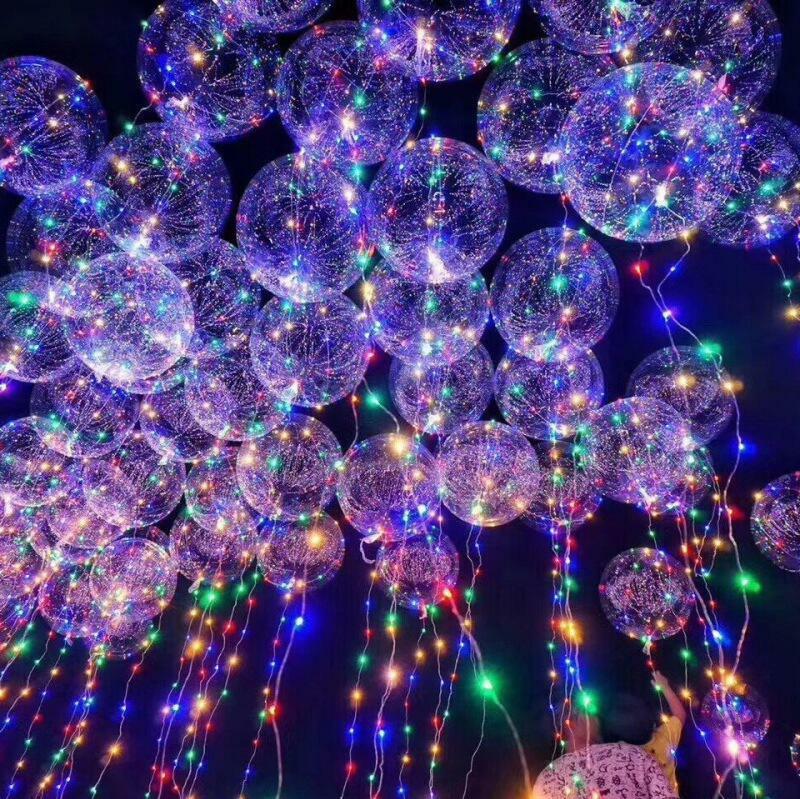 Some creative LED additions could be balloons, ice cubes, or even glasses. There are other LED uses for parties as well. Many party favors have LEDs in them. 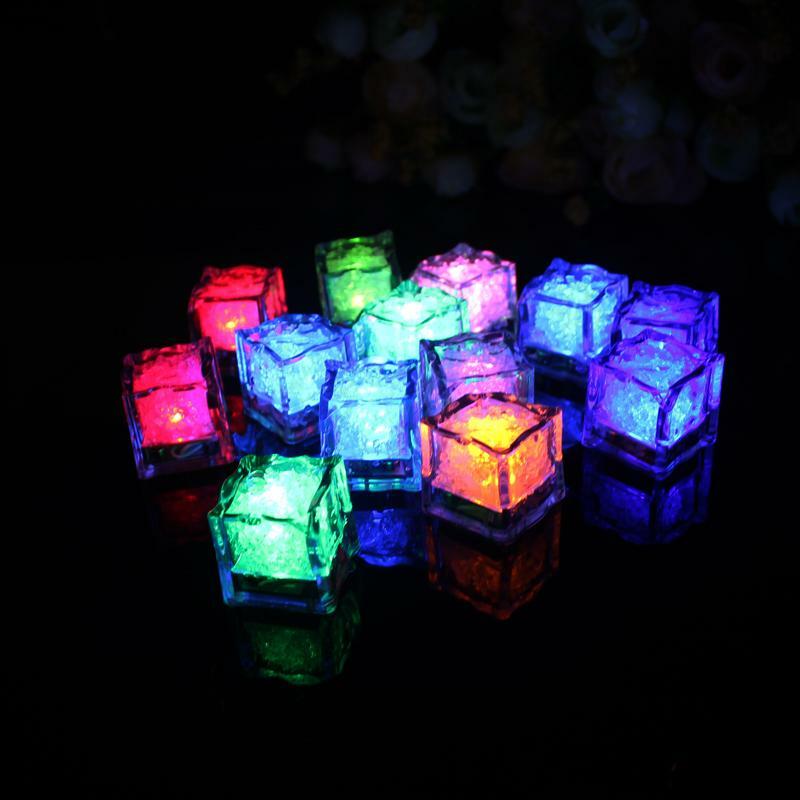 Therefore some of those party favors that the kids receive at their friends’ birthdays will have the extra attraction of lighting up. Another intriguing use of LEDs is in clothing. 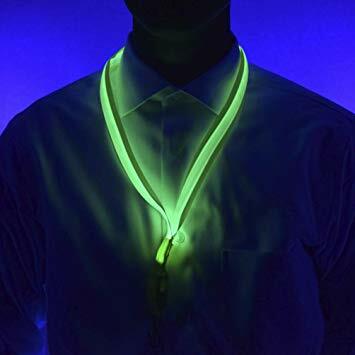 By adding LEDs to your clothing you can become a part of the entertainment. LEDs can be used for anything that you can wear. As you can watch below they can also be used as props. Not only is LED clothing interesting but they also open the door for multiple opportunities. A look can change in seconds due to LEDs. Also, LEDs add another element to what can be deemed a typical wardrobe. LEDs are not just for humans. Pet accessories have started to include LEDs as well. Leashes and collars with LEDs are used to make our furry friends more visible. This can prevent accidents or even make it easier to locate them. How often do people walk their dogs at night? Or even on really foggy days? 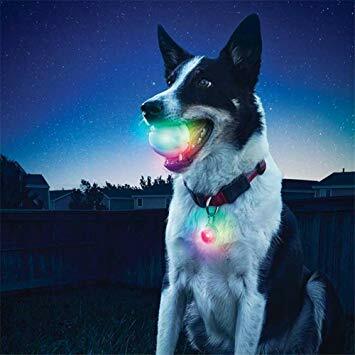 By adding LEDs everyday pet accessories become safer. Think back to when you were a kid and they had the Nerf light up or glow in the dark toys. Weren’t they some of the coolest things? You could go out in your yard after the sun went down and play with your friends. Pets also love to play outside. To them, it doesn’t matter what time of day. Dogs especially are always willing to take their favorite toy with them, no matter where they are going. 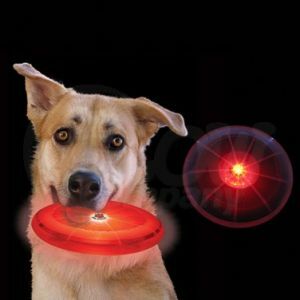 Light up dog toys add to the fun for the humans and the pets alike. Also, there is the added benefit that if the toys get left behind while playing outside they are easily found and returned to the pet that loves them. Therefore, LED pet toys not only extend playtime possibilities but can help you return your furry friends’ favorite toy to them. Check out these our other blogs! Interested in learning more about LEDs? We have blogs for you! 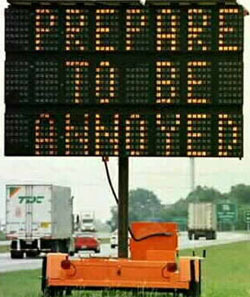 A Construction Sign usually signifies trouble ahead. 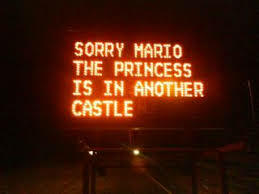 Also, construction can mean delays. 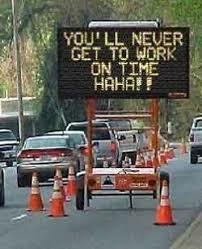 If you are already in a hurry or not in the mood to be stuck in traffic, a construction sign can be the most frustrating thing to see. 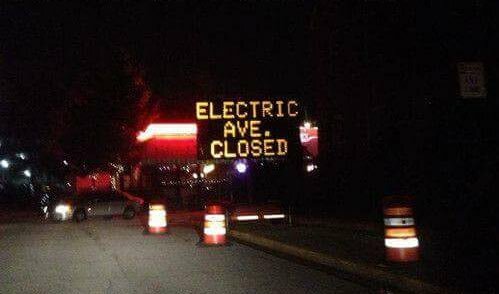 However, sometimes the road workers know that life needs a little spice. Therefore, some will call these fails. However, we choose to call them wins. 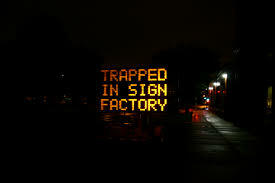 A Construction Sign is usually there to warn you of dangers ahead. Accurately, this sign did that. However, it was not in the way we are all used to. This one is just plain confusing. 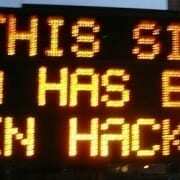 First off, is this just referring to the construction sign? 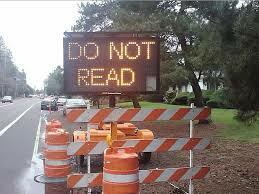 Does it mean “Do Not Read” at all? 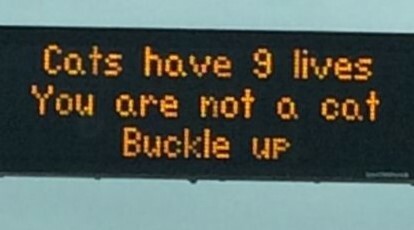 Finally, is it a subliminal message about texting and driving and not reading your messages? The world may never know. However, we can say for sure that by being a written sign it makes it difficult to do what it is telling us to do. Well, what do we do now? Where can we rock down to? There go our plans for the night. You know you laughed. Even if you were in one of these cars you would laugh. Therefore, can you imagine being stuck in traffic? Finally, you inch yourself up enough and you see this sign. Is it helpful? If you think sarcastic warnings are helpful then yes. However, isn’t the best part of the “HAHA! !” at the end? You can almost hear the evil laugh that goes with that. Isn’t this what everyone fears? You put in all the effort. You make the trip. Fight against the elements and other traffic. Then finally, when you get to your destination you realize it. You are in the wrong place. No one can say they weren’t warned. At this point, you might as well accept your fate. Therefore, the plus side is that you knew what was coming. However, that doesn’t seem like much of a positive thing. Some parks can be a lot of fun for the entire family. However, if this construction sign is telling the truth you may want to choose a different park. Furthermore, if you do decide to continue on hopefully you are not in a yellow jeep. Do you think they talk to the person who was trapped in the fortune cookie factory? Maybe they are friends. However, if they aren’t they should be. They have a lot in common. Wouldn’t you feel bad if this was a real call for help? Hopefully, they have WiFi and a vending machine. 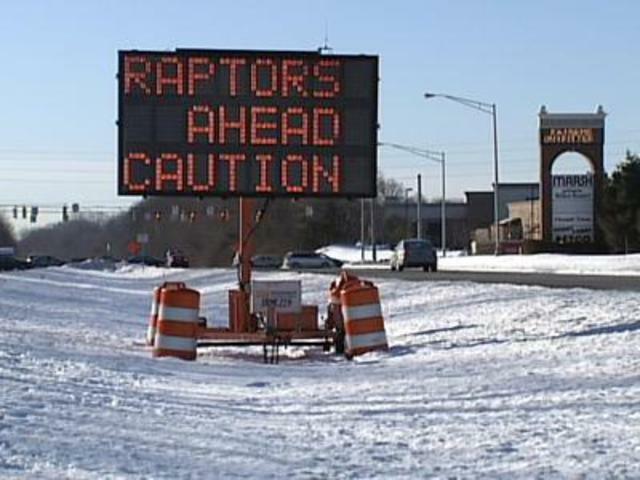 First, it was Raptors. 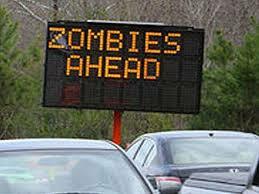 Now it is Zombies? Honestly, where do you vacation? Do you randomly pick places on a map? Or was this somewhere you were told about? However, Zombies can’t be as bad as raptors, right? 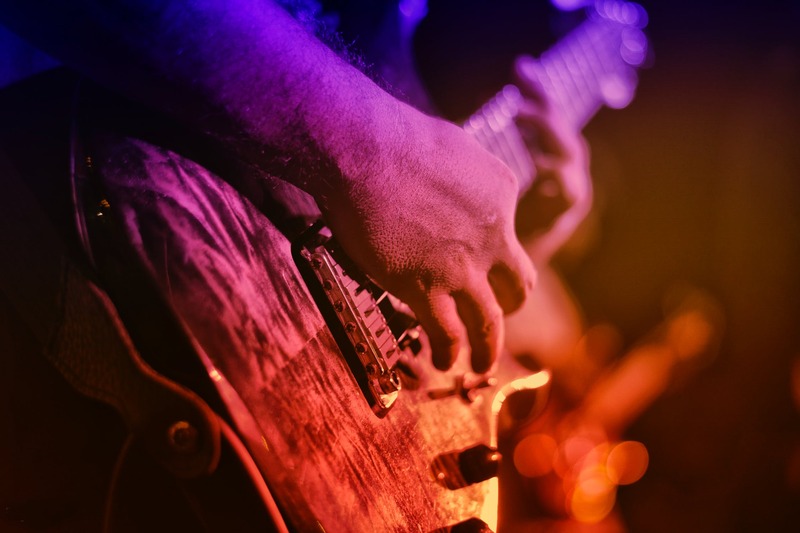 There are many things that affect a concert experience. However, one thing in particular can affect everything from the mood of the audience to how interactive they feel with the artists on stage. 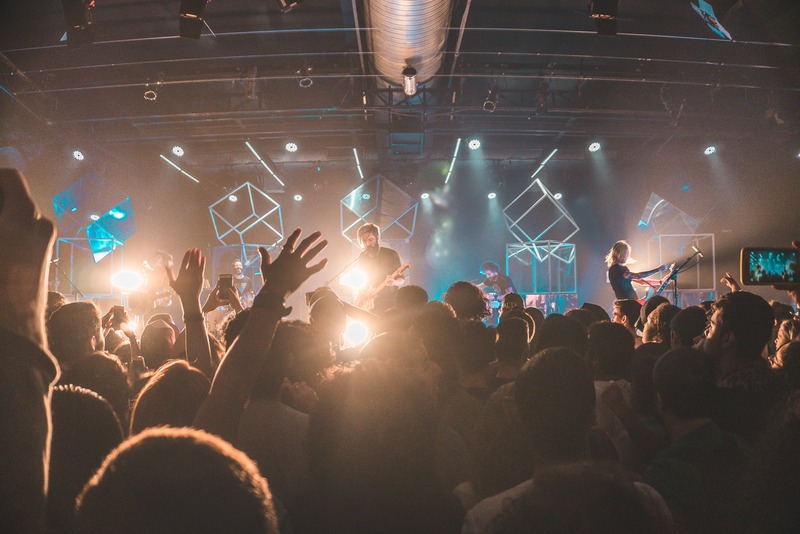 Concert lighting is one of the most important things when setting up a concert experience. Not only does lighting determine what the audience is seeing but also the connection the audience feels they have with the artists on stage. 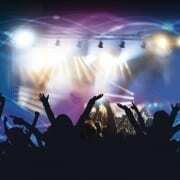 Anyone that has ever had a concert experience knows that it is not just about the music. Today’s technology allows anyone to have their favorite songs at their fingertips. So, what makes going to a concert an actual experience? The lighting of course. Furthermore, there are so many different lighting effects that are used during shows. Think about the differences between a small karaoke night at your favorite coffee house compared to a sold-out concert in a stadium that holds thousands. Not only is the overall atmosphere completely different but the stages are complete opposites. The coffee house may have a single light bar with a few different LED bulbs that are under the control of a single button. The sold-out stadium, however, would have a grander setup. LED lighting has made extravagant concert lighting more of a reality. Lighting directors are taking advantage of the different available LED colors to represent the band’s specific genre and taste. In addition to the colors LED lighting offers an alternative to other lights that give off large amounts of heat. Another perk of LED lights in a concert setting is the new advancements in cell phone apps and wristbands. There are now bands that will advertise their shows while including a link to a special app that they have designed for their audience. These apps help replace the lighters that concert goers would use during shows. Additionally, these apps have lighting that goes along with the rhythm of specific songs. Similarly, there are some bands that will provide wristbands at their concerts. Within these bands are small LED lights that are programmed to react to certain songs or notes that are played. Therefore, these wristbands help the audience to feel like they are more included in the concert experience. They no longer feel like they are just witnesses to the bands on stage but that they are also a part of the show. Want to learn more about LED lighting? 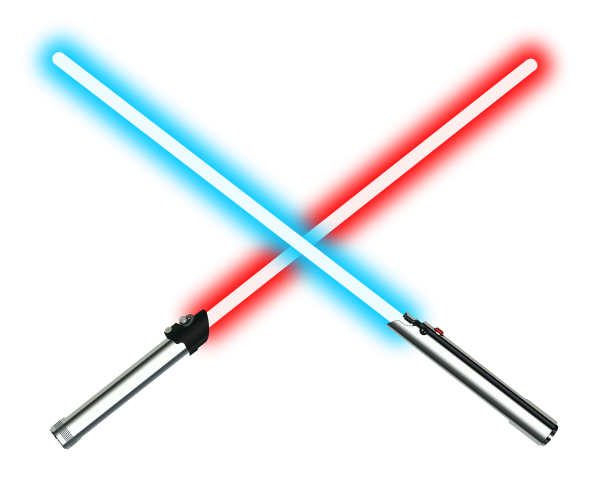 Check out our blog on LED vs. Incandescent. Solar Power has been increasing in popularity for some time. Due to their popularity, solar panels are in everything from road signs to houses. What are the most popular solar power items? Also, what really makes their functionality so promising? The basics of solar power are very cut and dry. 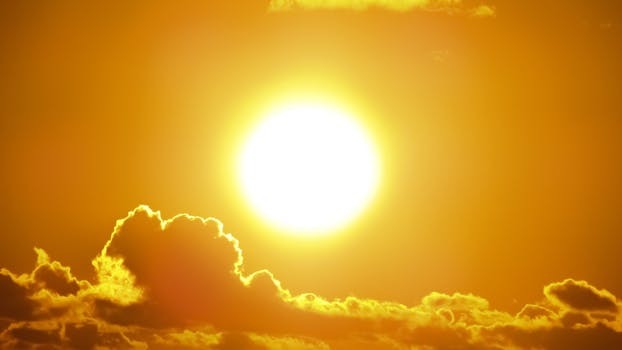 When sunlight shines onto a solar panel that panel either stores the light’s energy or it expels it immediately. The best way to think about this is to picture a car that has been sitting outside under direct sunlight all afternoon. Every part of that vehicle will be very hot to the touch. 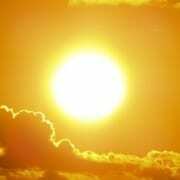 Therefore, that heat is the car expelling the solar energy. What solar panels do is collect that energy and expel it into devices as a power source. There is so much new technology being developed every day. Due to these new technologies, there are products constantly joining the market. Some of these new products seem very strange at first. However, all of the new products are serving a purpose. With all of these new products what are the most popular ones? Out of the products above, there are some that we can see in use in our own towns. When traveling at night it is easy to see solar outdoor lighting. Often these lights are illuminating front porches, flags or walkways. Also, these lights have become so common that you can find low priced versions of them in smaller stores. Another popular product is solar blue tooth speakers. Most outdoor patios have a version of solar speakers where they can feature their favorite music. These speakers are convenient for parties. Those times that you want to be able to set playlists and not have to worry about switching CDs or having the commercial interruptions of a radio station are what these speakers were made for. Also, with the many different designs, everyone is able to find one to fit their own style. Finally, a favorite solar-powered product is the cell phone charger. These chargers are not only for the outdoor enthusiast but for anyone who wants to have a charged phone on the go. Often while traveling there is not always access to power outlets. By having a charger that can power itself through solar you can be sure to always have a full charge on your cell phone during all of your running around. Thank you for reading our blog on Solar Power products. For more information check out some of our other blogs! 1. 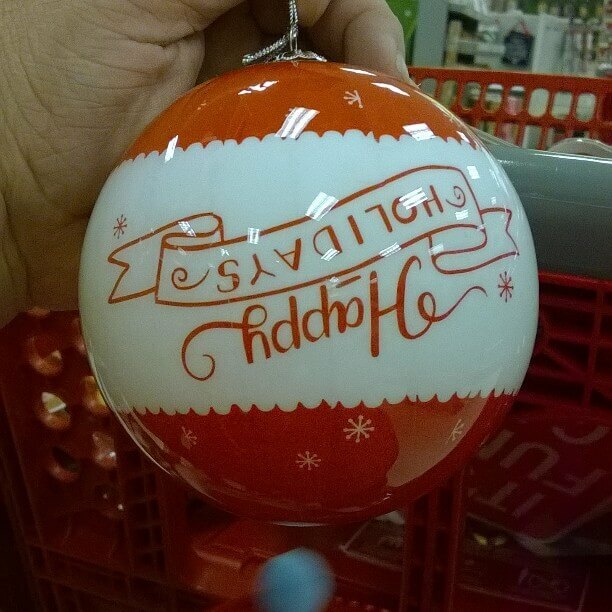 In this holiday display, Something just doesn’t seem right….? 2. They always say the simpler the better…..but this is just taking it to far! 4. Ketchup is good on everything, right? 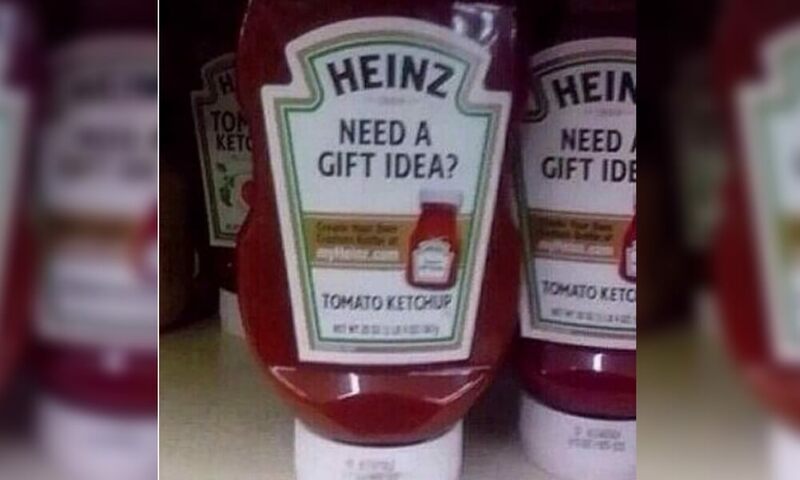 Just maybe not as a gift? 5. 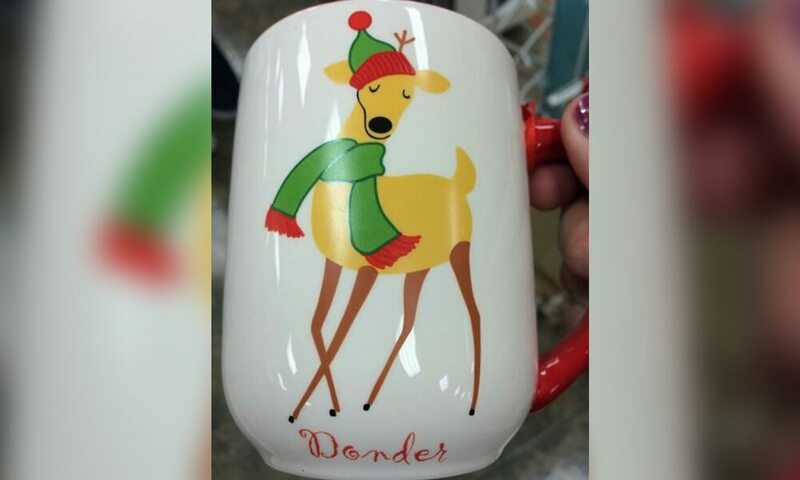 Is he part of Santa’s Reindeer? 6. 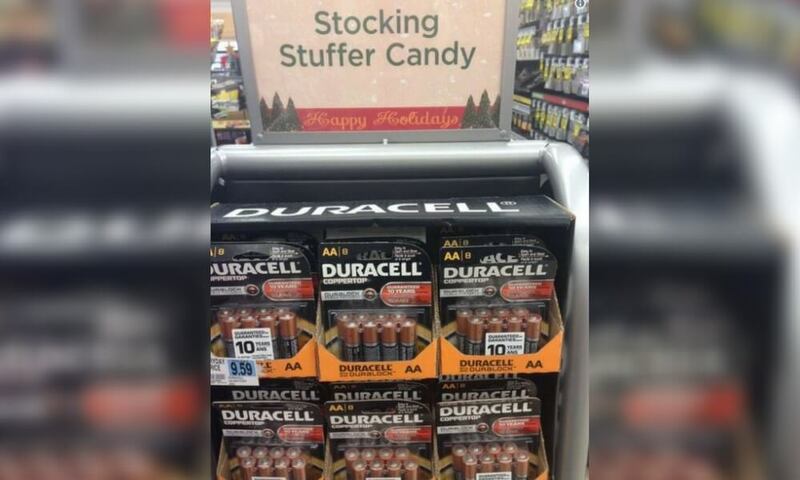 Everyone needs some batteries to go with their toys right? 7. 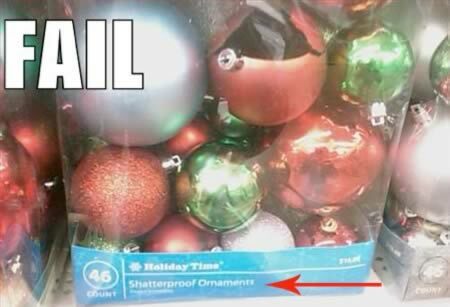 Shatterproof? I THINK NOT!!! 8. Yrrem Samtsirhc Aka Merry Christmas! 9. 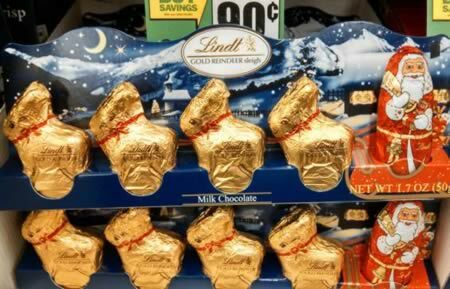 The Easter bunny wants his part in the Holiday season as well! 10. One of these things is not like the other….. Looks like the Grinch Stole Christmas! Check our other Holiday themed blogs! You can also find fun DIYs and Blogs on our Facebook. 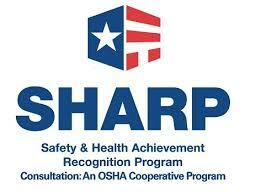 Safety and Certifications, Top "10"
Everyone knows Christmas isn’t the same without a tree. 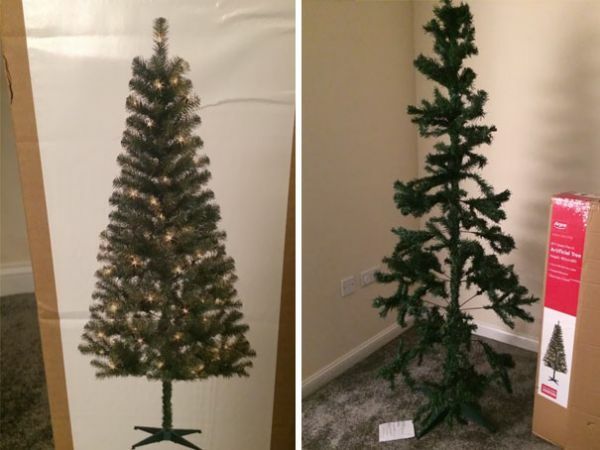 There are things you can do this holiday to ensure that your tree stays a beautiful decoration and does not become the subject of your disaster holiday stories. 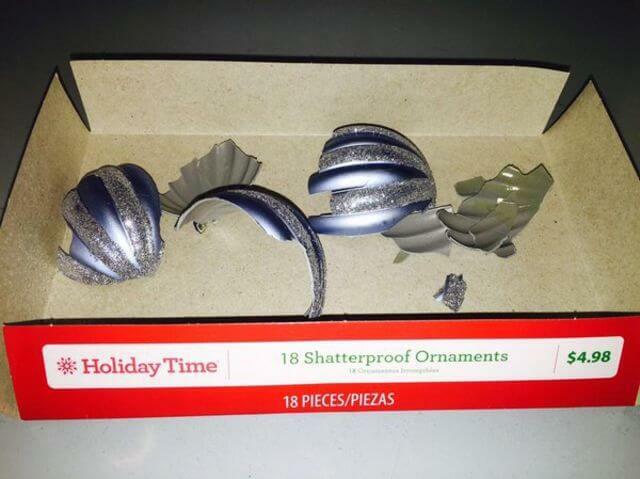 If you are purchasing an artificial holiday tree make sure that it is listed as being “Fire Resistant”. 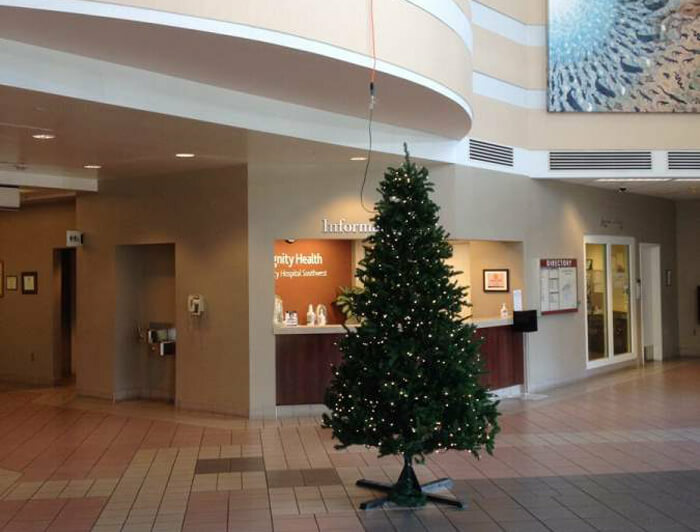 Therefore, making it more likely that in the case of an electrical shortage within the lighting a tree will not burn so quickly. Also, if you have a real tree you want to make sure that you keep it watered. Due to the nature of trees if they are dry they have a tendency to catch fire easily. Some lighting can create heat and a dry tree is susceptible to heat damage. 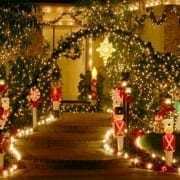 Using lights for decorating can add an extra flair to any holiday. However, you want to make sure that you are using them properly. Check lighting for breaks in the electrical lines. If there is a broken electrical wire there is a heightened chance of a fire or electrical shock. Also, if there are any broken or bents plugs do not use them. These broken plugs can not only short out the light string or any other lighting but, can cause damage to the socket they are plugged into. 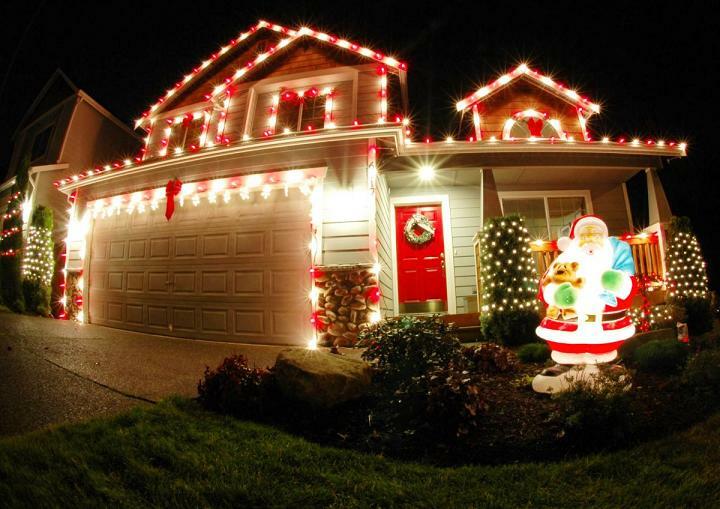 When decorating the outside of your house for the holidays there are some things to remember. Do not touch overhead power lines. They can electrocute you. Also, you could fall a long distance which could result in a serious injury. For more tips and top 10 lists check out our other blogs. You can also get great DIY ideas on our Facebook page! For more info on electronics manufacturing, please connect with us on Twitter, Google+, and LinkedIn. With the changing technology, there is a lot of question as to what is the better choice when it comes to lighting. 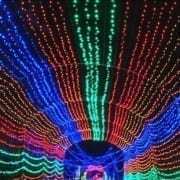 The main question is which is better; the new lighting option of LED (Light Emitting Diodes) or the well known Incandescent lighting that we all have become accustomed to. There are four main focuses in the argument of what is the better choice: the lifespan of the bulbs, the cost difference, how much power the different bulbs consume, and how much light they actually give off. One of the strong arguments in favor of LED lighting is their longer lifespans. At just over forty times the longevity of incandescent lighting, the newer LED lights are quickly proving their worth to consumers. This longer lifespan makes it easier for consumers who would have been purchasing numerous amount of the incandescents throughout a year’s time. There is less concern by consumers that they will have to have a continuous supply of light bulbs on hand at all times. Everyone has had that drawer or cupboard with boxes of light bulbs. They sit in waiting for the next time of darkness, that will come too soon. LED lighting can cut down on the amount of bulbs that consumers need to keep on hand by providing light for a longer amount of time. By installing the LED lighting and not have to worry about replacement for a longer time period there is a good reason to believe that LED lighting would therefore also be more cost-effective. The longer life of the LED bulbs implies that there will be fewer times of replacement. Over time this will save the consumer money. 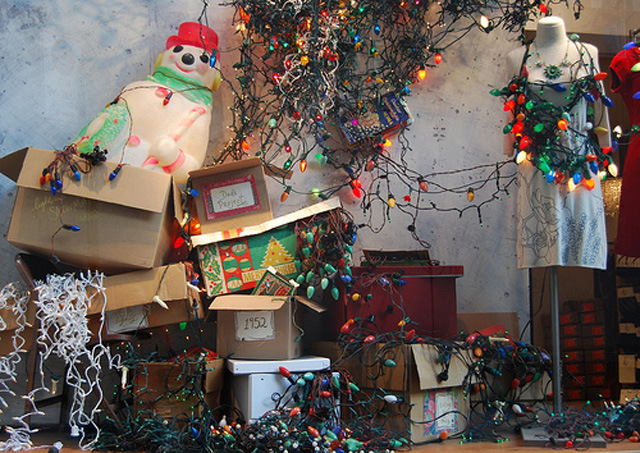 However, if you look at the initial cost LED lights are a noticeable amount more expensive than incandescent bulbs. Incandescent lights can usually be purchased for around $1 or even less in some stores. The $8 or more that LED lights can be found for can make consumers leery of savings. The initial purchase can seem a frightening amount higher to consumers. However, when they break down the facts about LED bulbs they will more than willing to pay the extra amount. The lifespan of the bulbs already saves the consumer money by cutting back replacement costs. The consumer can also look at the price decrease with the decrease in their electricity use. In some cases the LED bulbs have been known to use five times less the amount of electricity than that of Incandescent bulbs. That decreased use of electricity can add up to a decrease in electricity bills. There is one major difference between an incandescent bulb and an LED bulb. The incandescent bulbs that everyone has become so accustomed to being purchased on their amount of wattage. While the LED bulbs are measured by their lumens. 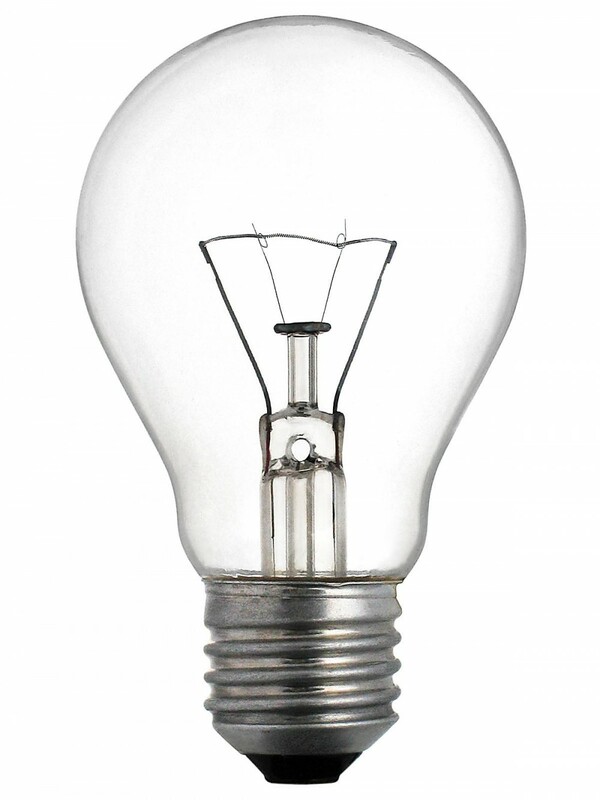 The idea is that the amount of power running through the bulb affects the brightness of the light. 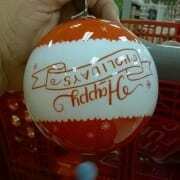 This, however, is only true with the incandescent lights and not the LEDs. LED bulbs are made to use a lower wattage but have a higher output of lumens. Lumens are the more accurate way of measuring the strength of a bulb. Watts only measure the power running through a bulb, not the amount of light that is given off. LED light bulbs are able to function at a lower wattage. LEDs are able to maximize the amount of light that is given off for use. 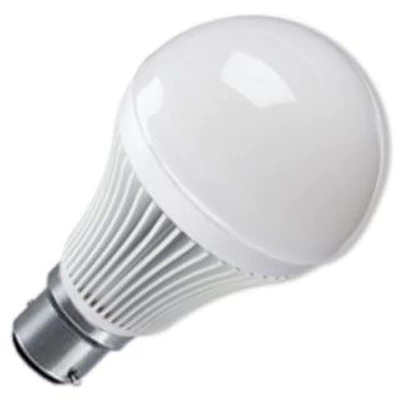 For example an Incandescent bulb that is rated to be at 150 watts would have the same amount of lumens that a LED bulb rated to be between 25 and 28 watts. The two bulbs are using very different amounts of power. They, however, are achieving the same amount of light that is being seen. Looking at the differences between the bulbs it is easy to see the benefits of using LED over Incandescent. LED bulbs not only save money but attribute to saving energy. They do this all while doing a better job of lighting up the darkness. Comparing the two types of lighting shows the changes that technology is bringing to everyday objects.